May is such a provocative month – it’s steamy hot, then cool, then rainy. I’ve been dodging raindrops for days now. The past three have been cool and breezy and things dried up enough to have a particularly productive day with the once-a-month garden helpers. The farm has been expanded. I stared at the sun patterns, and the grade and all the challenges all over and the idea came to me in a flash – remove the ground cover, and uncover ground in which to plant vegetables. Goodness, how utterly simple. The area between three big, rangy mature oakleaf hydrangeas and the stone wall at the patio was thick with vinca – it was taking over and choking out all the roses, junipers and whatnot perennials I had popped in there in past years. The ground was moist and easy to work after all the rain, and out came that vinca exposing what looks to me like miles of sunny garden. Tomorrow, there will be tomatoes, cucumbers and butternut squash finding life in that bed. I also had the crew remove some daylilies. Not nearly enough daylilies as far as I’m concerned. I have my eye on some additional clumps that could disappear without even being missed. I’m just hating them. And I crave more sunny space for my crops. I removed more daylilies. Couldn’t help myself. It’s like realizing you really don’t look good in pink, and eradicating pink from your wardrobe and lipsticks. My garden doesn’t look good in daylilies. There are still at least a dozen clumps, but until I have a better idea for that part of the garden, I’m going to stop digging them out. And now, where once there were daylilies, there are drills of lettuce ‘little gem’, lettuce ‘all the year round’, and lovely red traditional beets that I will pull when they are very small. And now, there are trellises set up and seeds of yellow beans planted and cucumber starts touching leaves to the structure, eager to run. Today everyone got a fish fertilizer bath. The garden looks very happy. The transplants are especially delighted. Even the mignonette strawberries. If those plants actually produce, I will be amazed. And I will make the most delicious jammy jam with mint. Or balsamic and black pepper. 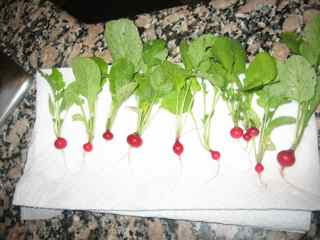 More radishes today – with sweet butter and crunchy smoked salt and Cotes de Rhone. It’s a lovely late Spring evening in the garden and the barred owl is calling to the owlets. Birders say their call sounds like Who-Cooks-For-You? Mother Nature, that’s who.